Dragon Warriors is a game from the heyday of pen and paper roleplaying games, the 1980s. Penned by Dave Morris and Oliver Johnson, it was originally published by Corgi Books. They used a paperback format, which gave the game the appearance of the incredibly popular Fighting Fantasy gamebooks, and indeed many bought into the game thinking that’s exactly the kind of thing it was. 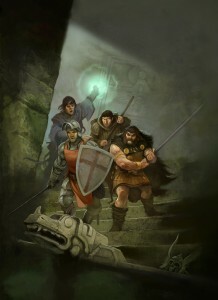 Dragon Warriors was in fact a full roleplaying game, with a Games Master and a group of players taking roles within the fantasy world of Legend. This being the 1980s, the game bore some distinct resemblance to Dungeons and Dragons. However, it came with a distinctly British flavour, especially when it came to the included setting – the Lands of Legend. Originally only available in the UK, Canada, Australia and New Zealand, Dragon Warriors is largely unknown in the United States. In those countries where it was on sale it formed the gateway rpg experience for a whole generation of gamers. Inevitably the gaming paperbacks bubble burst, roleplaying could draw no further mileage from accusations of being a bad influence on children, and the books disappeared from print. The game itself never died. Fanatical Dragon Warriors gamers continued to play this well loved game down the decades. The foremost community can be found on the yahoo DragWars community, and the Dragon Warriors Wiki. Fast forward to the 21st Century, and in 2008 Magnum Opus Press revived the game in a new edition, collating rules information from the original six paperbacks into one glorious hardcover edition with all-new artwork. The various adventures and campaigns were also published in separate volumes along with a bestiary. The great wheel turned on the Magnum Opus edition, and it was decided in 2010 that they would not renew the license to publish the game in 2011. And thus was formed Serpent King Games – a bunch of ne’er-do-wells who had worked on the Magnum Opus edition, and decided against all sense and reason to keep the game alive in print form. With the kind support of Magnum Opus Press they will keep those books available to gamers, as well as producing new material for both rules and setting. The game itself is renowned for its simplicity. Character creation is lightning-fast, and the rules allow for very speedy play. As such it is beloved by both those seeking the nostalgic joys of youth, and new players looking for a light but solid fantasy rules set with a great setting. If one were to be critical, which would be insane in what amounts to an infomercial, it could be argued that the streamlined nature of DW pushes it outside the heavy crunch of the current old school rpg renaissance, whilst its long heritage and 1980s pedigree prevent it from being seen as a contemporary game. The huge strength of Dragon Warriors has always been in its rich setting alongside easy to learn rules. Legend is a game world of unsurpassed atmosphere and depth. An analogue of our own world in the early European middle ages, it is dripping with folklore, faerie, myth and legend. It is immediately familiar and easy to understand to anyone who has watched Robin of Sherwood, or read Ivanhoe. It has a clearly British feel – down at heel, grim, gritty, horrific in places. The names are right – Cornumbria, Ellesland, Albion, Glissom. No one has nice teeth in Legend, and no one ever wears a chainmail bikini. Elves in Legend are not tanned crafters who speak funny. They are the unknowable inhabitants of the otherworld, as likely to kill you in passing as marry you and take you away under the hill for 100 years. Goblins aren’t those funny green dudes who slice into XP chunks. They’re mean-spirited, twisted and murderous denizens of the forest, where you don’t go at night or you’ll be killed. Essentially in Legend the beliefs and fears of the medieval European peasant are real. Players chose from a range of professions for their character – the knight, barbarian, mystic, sorceror, warlock, assassin, or elementalist. They are defined further by a string of familiar statistics like strength and reflexes, and a number of health points. Characters gain ranks with experience, but a key point that gives Dragon Warriors its brutal reputation is that health points are gained very very slowly. The progression curve is shallow. A knight of the 10th rank has a great deal to fear from a gang of angry peasants with staves and a knife or two. Combat is turn based, with a simple initiative system based on reflex score. An attack roll based on the attacker’s ATTACK score vs the defender’s DEFENCE, a roll to bypass an opponent’s armour based on weapon, and then a fixed amount of damage by weapon type, form the basis of DW combat. It’s very simple, very easy to learn and remember, and hugely brutal. Knights use heavy armour and shields and have good defensive scores. Barbarians eschew heavier armour and defensive fighting for all out attack. Magic comes in a two main flavours. Sorcerors have spell points, and can cast any spell from their rank’s spell list provided they have sufficient points. Mystics’ magic use depends on rolling to remain unfatigued. All characters can use any weapon, and wear any armour they chose. It is not DW style to have arbitrary rules forbidding such things. However a puny sorceror fighting with a two-handed sword is on the highroad to the afterlife, and armour impedes his or her ability to cast spells.